A tennis court with a blue acrylic floor is set up in a room. The base of the tennis court measures 23.77 x 10.97 m. Black tennis nets are stretched in the middle axis of the T formed by the service line and the center service line. The deployed nets form a cross. At the ends of the field, 80 cm high ramps are positioned. 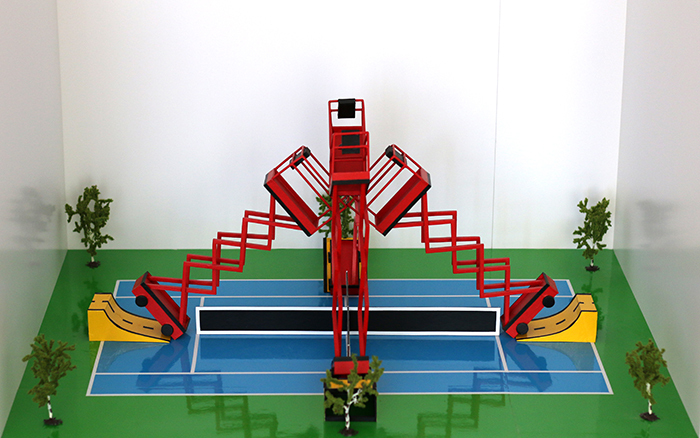 A scissor lift stands before each of the four ramp. The scissor lifts are traveling simultaneously with the same speed up the ramps. At an undetermined point, the scissor lifts on the ramp will incline toward the center, colliding with the opposite scissor lift. Maybe all four scissor lifts will come to a standstill leaning against each other in the middle of the playing field. Some of the scissor lifts might possibly overturn.